Click here to order an Altro Kitchen Sample Pack! We were the first company to innovate a complete system of compatible hygienic wall sheet and safety flooring. 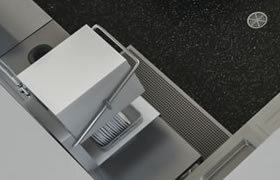 As the system is fully integrated, it fits together perfectly to provide a hygienic, watertight solution. 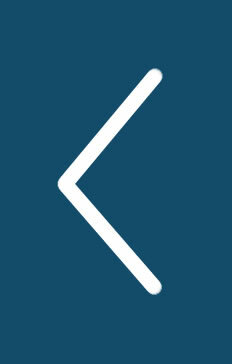 No gaps or rough edges, just a smooth, uninterrupted surface – even around plug sockets, light switches and corners. The system offers the best possible protection against bacteria, bugs and vermin. 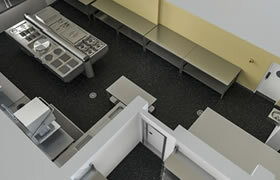 Altro’s integrated floor and hygienic wall protection system makes cleaning easier too. Food and drink preparation and cooking areas can spell danger. Grease, fat, cooking oil, flour, milk, food particles and the occasional chopped carrot – all can end up on floors and walls. Altro’s sustainable, integrated safety floor and hygienic wall protection system provides long-lasting, safe and hygienic surfaces for wet, dusty and greasy conditions. The World Health Organization states that up to 30% of industrial nations’ populations suffer food poisoning every year, and research shows kitchens to be the chief culprit, while contamination of surfaces is in the top five causes of food poisoning. 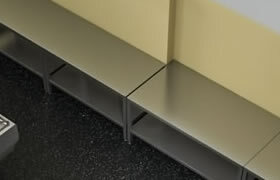 Our integrated hygienic wall sheet and floor system is tankable. It has impermeable surfaces, which are easy to keep clean. With regular cleaning and maintenance using traditional solutions, Altro floors and walls do not allow bacteria to hide and grow. chemical, physical or allergenic risks, caused by ingredients, handling, equipment or fittings, including floors and walls. You can reduce hazard risk and keep inspections to a minimum by selecting Altro floors for kitchens and hygienic environments and hygienic wall sheets, which are all approved by HACCP International. 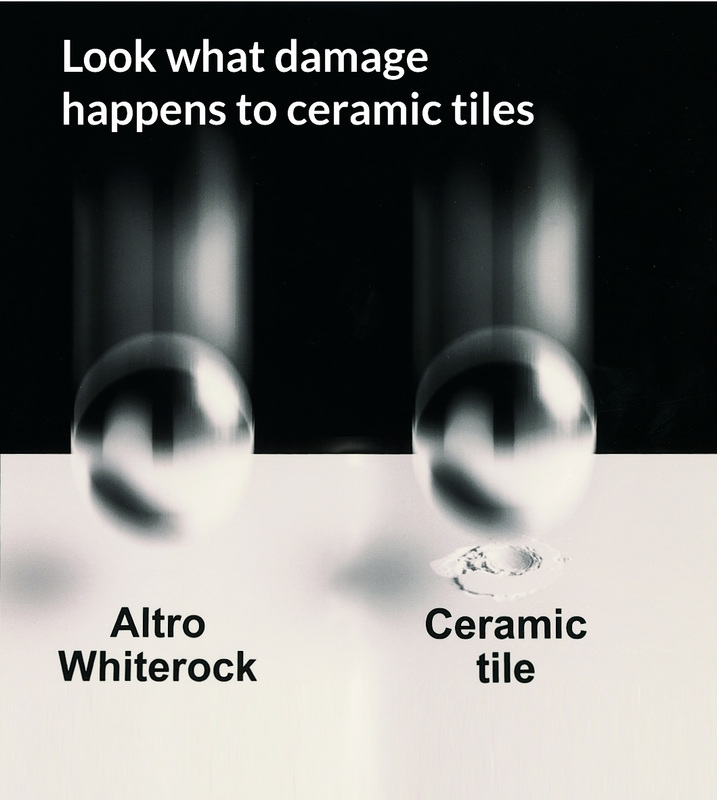 The Altro Whiterock wall sheet system has an extremely high impact resistance according to BS EN438-2-1991 Steel Ball Test (see image). Impacts that would leave ceramic faces vulnerable to water ingress barely leave a scratch on this tough surface. 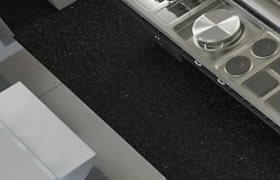 The same is true for the sheet’s thermoformed corners – an area where ceramic tiles are particularly vulnerable. 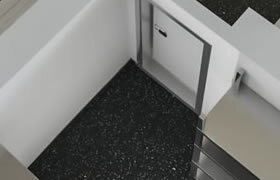 Altro Whiterock also has an excellent Fire Rating: Altro Whiterock White and Altro Whiterock Satins have been assessed to EN13501-1 and obtain a Euro-classification of -s3-d0. Altro resilient floors for kitchens and hygienic environments and hygienic wall sheets are HACCP (Hazard Analysis and Critical Control Point) compliant, providing peace of mind with the risk assessments of environmental safety. You may see safety and hygiene as paramount in the main kitchen – but there are hazards throughout the back of house too. From the time a kitchen assistant walks through the ‘goods in’ with the food delivery, until they leave at the end of their shift, they are walking throughout the kitchen and coming into contact with contaminants and slip hazards. No area is safe. So the best way to ensure hazards are avoided is to have the whole environment secure. Altro give you the security you need. "Altro’s products have helped create a welcoming environment in the kitchen areas which has been well received by staff and students. As well as looking good, the walling and flooring products have lived up to their reputation of being easy to maintain. In a busy college kitchen it can be a dangerous working environment, so slip resistance is another important benefit of the new flooring to help us to avoid accidents." According to the Food Standards Agency, cross-contamination is one of the most common causes of food poisoning. 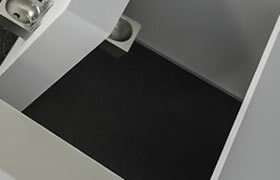 Altro Stronghold 30 has Altro Easyclean technology, making it straightforward to clean and maintain. "The Altro floors and walls in the kitchen can be cleaned with jet washers, which ensure impeccable hygiene while simultaneously saving time on cleaning. Our other priority is safety, and the slip-resistant properties of Altro flooring respond perfectly to our demands. In addition, with a certified installer, the installation is extremely quick: the restaurant kitchen at Issy les Moulineaux was completed in one week." Use colour to subtly create a mood with Altro Whiterock Satins. This versatile and sophisticated wall sheet is available in a range of 26 solid, decorative, satin shades – from soothing through to stimulating. Big chunky details get broken easily. They’re also hard to clean. Some wall sheet joint strips and wall / floor transition strips frequently have really horrible grease behind them when taken off the wall during refurbishment, hiding not only contaminants but bacteria as well. By welding or using Altro Whiterock FlexiJoint, joints can be completely sealed and impervious to contaminants, including bacteria, water, oil and grease. "After working with Altro Whiterock on a number of projects I knew the Chameleon range would be perfect for the new Rock Pool kitchen. It has a high end look but still provides a smooth, durable, watertight and wipe-clean surface. The end result looks fantastic and I know that it will stay that way for many years to come." "Altro's products have helped create a welcoming environment in the kitchen areas which has been well received by staff and students. As well as looking good, the walling and flooring products have lived up to their reputation of being easy to maintain. In a busy college kitchen it can be a dangerous working environment, so slip resistance is another important benefit of the new flooring to help us to avoid accidents." "We are very pleased with the Altro products and I am confident that they are helping us to achieve some very impressive results for health and safety. We recently had our environmental health inspection and I am delighted that we received the top grade. Overall I am delighted with the performance of the Altro products. 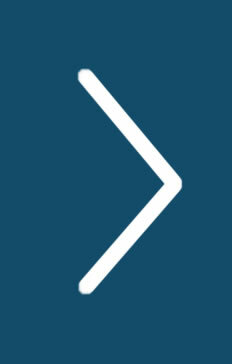 They are really helping us to achieve and maintain a high standard for our college and the community." "We wanted to source the very best brands for the school and this meant that Altro was the number one choice for floors and walls. 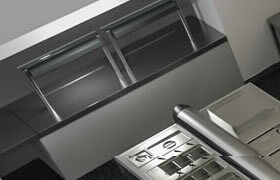 I have used their products before in kitchens and they are superb quality, they look great and are built to last. In my experience, no other product can compete with Altro. I have used both these products before in professional kitchens and they are undoubtedly the best; easy to clean, practical, safe and they look the business."